The new Memorial Garden in Ellesmere Port was opened on Friday 11 May by the Mayor of Ellesmere Port, Councillor Nicole Meardon. The garden at the junction of Cromwell Road and Whitby Road is the new home for the Mersey Ironworks memorial plaque. 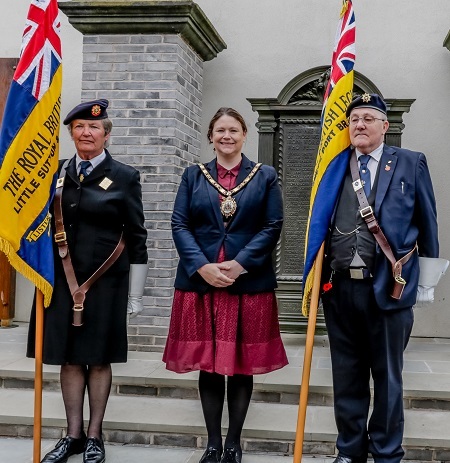 Councillor Meardon said: “This wonderful Memorial Garden in the heart of the town could not have been created by Cheshire West and Chester Council without the support of many people and organisations. “Thanks to St Modwen who own the site, Paul Copeland of Glowquest for a party wall agreement, the local branch of the Royal British Legion for their support, RBL Property for safekeeping the memorial plaque, Andy Mitchell for restoring the plaque, Richard Walters of WE Parsons for the garden construction and the War Memorials Trust for grant funding the repair of the plaque. I really appreciate that so many have worked together in achieving this project for the town. The plaque was repaired by metal conservation specialists Andy Mitchell from Hereford with the support of the War Memorials Trust. The plaque has been treated with Smartwater, which contains a chemical that will make it impossible to re-use the metal without it being identified as a protected war memorial, making any criminal attempt at stealing it useless. The War Memorials Trust, said: “Blood, sweat and tears went into this is a phrase we often hear. This war memorial is perhaps one of those occasions when that is literal. The Mersey Ironworks memorial plaque was assumed lost to the town for some years; however it was actually kept in secure storage by the Royal British Legion in Saltney. After the plaque was removed from the Stanney Lane site, the Chair and Secretary of the local branch of the Royal British Legion asked the Council to locate it, find a new place for the memorial plaque, and bring it back home to Ellesmere Port. The memorial garden was designed by Cheshire West and Chester Council with the restored plaque as a centre piece.